Plunging oil prices have sent the price for virgin plastic down even below the price of recycled plastic, just the latest problem for the recycling industry. New polyethylene terephthalate, a type of plastic known within the sector as PET and used to make soft-drink and water bottles, cost $0.83 a pound at the beginning of 2015, according to trade publication Plastics News. At that time, the price was 15 percent higher than the cost of recycled PET. However, as of late March, the cost of PET had fallen to $0.67 a pound, 7 percent less than the recycled plastic. That’s not the industry’s only problem. Fewer newspapers are being produced, and the amount of printing and writing paper has only recently started going down significantly, leading to less paper for the industry to cash in on. And in an ironic twist, new forms of packaging are making recycling more difficult, part of the reason why some plants are closing, and others are getting retrofits to manage waste streams better. 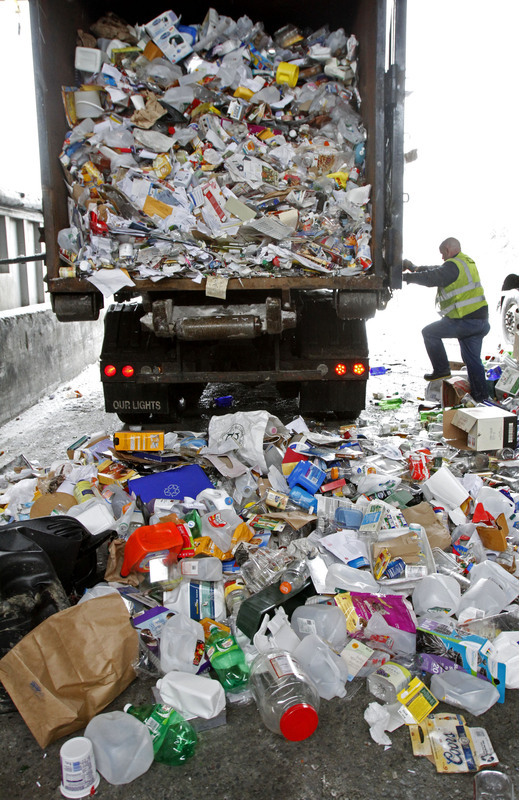 Another problem has arisen recently for recycling companies. For a while, companies encouraged nearby residents to put all kinds of products in their recycling containers at the curb, with the companies vowing to separate the items. But the falling price of commodities has exposed a problem with this method—a higher cost to separate the recyclables—with some loads being completely contaminated by products that can’t be recycled. Previously high scrap values masked this problem and also hid how a lot of junk was being included in the bales of product that recycling plants produce, Patty Moore, CEO of Moore Recycling Associates, an industry consulting firm, told Epoch Times. China and other countries that import our recycled bales “didn’t want to take junk anymore,” and put the onus on the recycling plants to separate better. I don’t think crisis is too strong of a word in the recycling industry throughout the United States. Even with recycling companies meeting the new requirements, demand has been lackluster in China and Europe due to several factors, including the price change for virgin versus recycled materials. 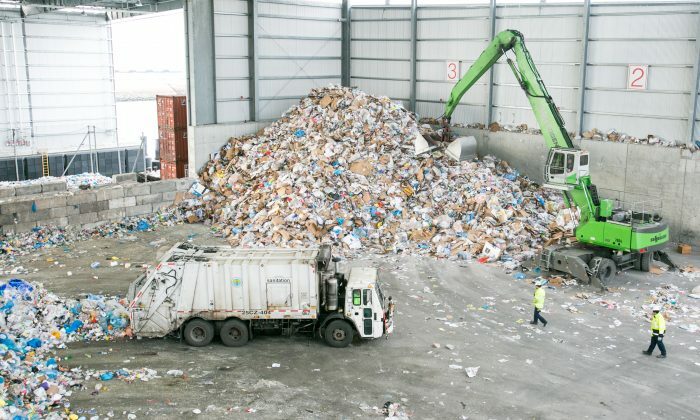 “If you look back over the last 15 years, when China’s demand goes up so do prices, and China’s demand has been lackluster,” Bill Moore, president of Moore & Associates, an international consulting firm specializing in the paper recycling industry, told Epoch Times. Yet another issue stems from recycling companies seeing a much different mix of products entering their plants than even five years ago. That includes more plastic, which has historically been one of the most valuable products to recycle, but actually costs more to recycle because it weighs more. “So you have this whole series of things happening at once—a requirement to improve the quality of the bales, a greater volume to weight ratio, a lower scrap value,” Patty Moore said. “All of these things piled up has really put pressure on Materials Recovery Facilities,” or recycling plants, known inside the industry as MRFs. Waste Management, the largest waste service provider in the United States, has been hit hard by the confluence of factors hitting the recycling industry. A 1-ton bale of recycled paper used to go for $150, but now only goes for about $60. Waste Management couldn’t be reached by press deadline, but CEO David Steiner recently confirmed to NPR that the company has shut down multiple plants. “I don’t think crisis is too strong of a word in the recycling industry throughout the United States,” Steiner said, noting that he’s seeing numerous recycling companies going out of business. A specific measure of the downward cycle of commodities—a 1-ton bale of recycled paper used to go for $150, but now only goes for about $60. Commodity prices are starting to inch up, and signs have emerged lately indicating markets in Europe and most of Asia will get better soon. At the same time, the downturn has forced companies to adapt, which could put them in a better position in the future. Casella Waste Systems, a Northeast waste service provider, has added fees to waste that comes into its facilities from third-parties, reflecting the depressed level of commodity pricing, reported the Waste360 blog. The company has also added what it calls an offset to the loads that come in on its own trucks, which is also based on commodity prices. Patty Moore noted that the recycling industry has to make infrastructure changes to keep up with the new packaging. For example, one part of the environmental movement is packaging with less plastic, which has presented problems for the industry, which has in the past made the first separation inside the plant between 2-D products, mostly newspapers, and 3-D products, mostly plastic. “As we’ve moved toward lightweight packaging, that means that some of these things that used to be 3-D are now only 2-D,” she said, such as some water bottles that “practically collapse” without water in them. She expects the industry to keep getting better to capture the more efficient plastics, but also notes that companies outside the sector should make sure that the new packages are recyclable. NEW YORK—In 2015 a New York law will go into effect that makes it illegal for New York residents to throw their electronics out with the trash. The city can now add wind energy for commercial use to its list of sustainability initiatives.